I made this card for this week's clean & simple challenge on splitcoast stampers. This week is a theme challenge and the theme is 'Fairytales'. I looked through my stamps to see if I could find something that might work for this challenge and I thought this castle image would be perfect. Because I spent some time coloring the image I wanted to keep the rest of my card simple and so all I really did was a little bit of paper piercing around my image. I used the new paper piercing pack in the new catalog and I placed the template over my image and I began piercing my card stock. I stopped piercing once I reached the bottom of the castle image and then I made the row of piercing go straight across, but my ribbon ended up covering that row. Next, I stamped my sentiment, tied on my ribbon and I layered it onto my white card stock base and that was it! It took me about 15 minutes to make this card, quick and easy! Have a great night! Beautiful cas card. Love the pink. Oh that is sooooo darling! 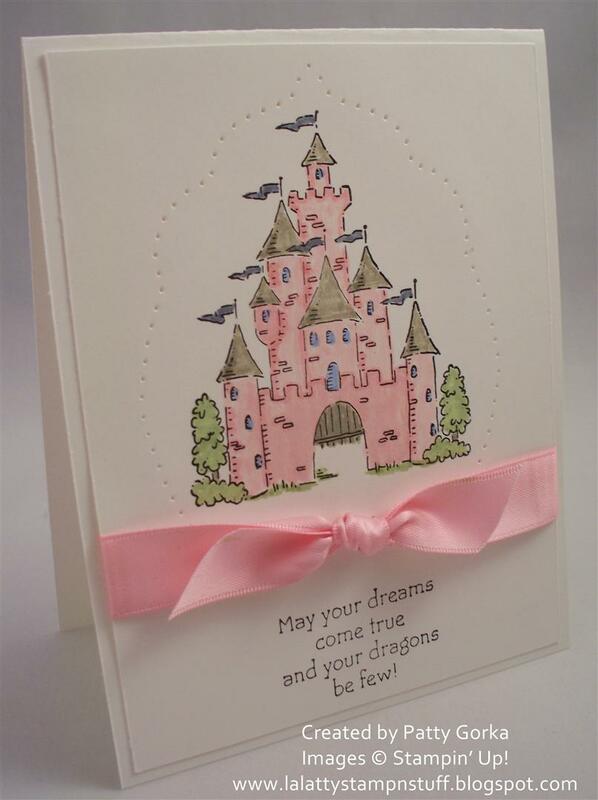 Great choice to make the pink castle the focus of your card! I LOVE it!